This last weekend saw my wife and I again in South Africa's KNP (Kruger National Park), where I witnessed several happenings which gave rise to me writing this weeks blog post. In the animal and plant kingdoms there are many 'symbiotic relationships' ('living together', regardless of the nature of the relationship). These 'symbiotic relationships' are broken down further into Parasitism, Mutualism and Commensalism. Parasitism is where one 'organism' only benefits from the 'symbiotic relationship' while the other party is actually harmed. Mutualism on the other hand is where both 'organisms' benefit from the relationship. Commensalism is where one 'organism' benefits but does no harm to the other organism. It is possibly 'Parasitism' which I witnessed this weekend in the form of a large mammal and a bird, which was until recently thought to be the 'symbiotic relationship' known as Mutualism, maybe you have your own thoughts on the matter ? The bird is the 'Oxpecker' of which there are two species, the Red-billed Oxpecker (Buphagus erythrorhynchus) and the Yellow-billed Oxpecker (Buphagus africanus). The particular mammal in this instance was the humble Impala with whom this 'symbiotic relationship' has been ongoing for a long time. 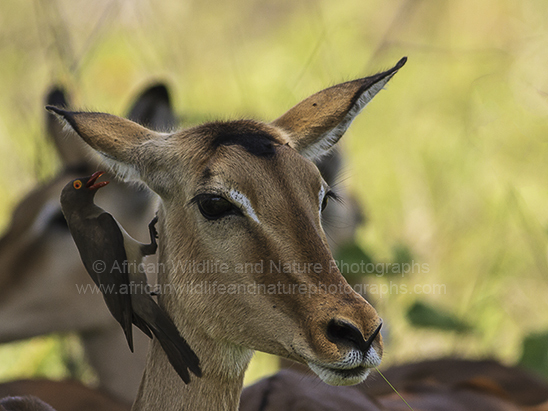 Red-billed Oxpecker (Buphagus erythrorhynchus) perching on an ‘Impala’ host.